create luscious canned goods that could win a blue ribbon at the County Fair! This particular project stresses individual creativity - perfection is not necessary. Even Nature's harvest is not perfect! It is also meant to spark your imagination on to other canning projects, and more recipes will follow, such as Strawberry Preserves, Pickling Corn the Shaker Way and more. Perhaps it is the sense of accomplishment that is experienced in real life when harvesting a crop of home-grown vegetables (or market-bought for that matter) and putting them up in cans, that made this workshop a favorite with my students. 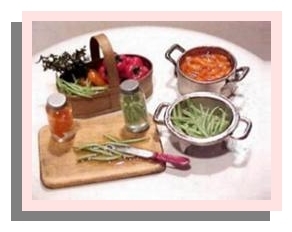 Even in miniature, creating the vegetables and "home-canning"